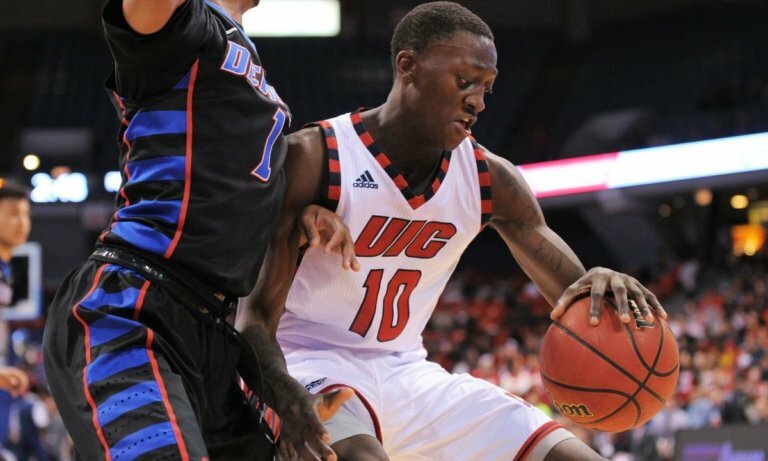 UIC Flame Dikembe Dixson looks to get hotter with the Miami Heat this summer. A UIC Flame, Dikembe Dixson isn’t afraid to get hot. The question is, how heated can he get with Miami this summer? Despite not trading for a 2018 NBA Draft pick on Thursday night, the Miami Heat front office is getting ready to feast its eyes on some new talent. With 2018 Summer League play starting up on July 2, another batch of undrafted talent will soon be pulling out all the stops to try and lock in a professional contract. A 6-foot-7 forward, the Flame has averaged 17.4 points, 5.4 rebounds,1.3 assists and 1.3 steals a game over three years at UIC. He finished last season averaging 14.2 points, 3.5 rebounds and 1.3 steals per contest, in 29.7 minutes of play. As a freshman, he was unanimously selected as the Horizon League Freshman of the Year and named to the All-Horizon League Second Team. He set a conference record for scoring with 594 points, breaking a prior record set by UIC Flame Mark Miller, and ranked third in scoring. Dixson also ranked second in minutes played, as well as seventh in rebounding. And since then, he’s only further perfected his craft. What’s more, he’s beyond ready to prove he’s worthy of playing in the NBA. It certainly sounds like he has the right mindset to fit right into Miami’s system. Between always believing in himself and being up to doing anything it takes to help his team succeed, the Heat front office should keep a close eye on the up-and-comer. Especially given his raw talent. Something he recently showcased at the 2018 Professional Basketball Combine. Of course, there’s also the 40-point, 17-rebound game he had against Youngstown as a mere freshman. And to think he almost attended DePaul instead. It was newly hired head coach Steve McClain who helped Dixson see the light. Now well on his way to permanently join the association, at one point, Dixson was afraid he’d never play again. Having torn his ACL just ten games into his sophomore year, he was devastated but determined to come back stronger than ever. The Miami Heat might have found themselves a keeper, beyond just Summer League play.